In an effort to reduce the U.S. infant-mortality rate  which is currently 30th worldwide, worse than Hungary's and Cuba's  public-health advocates are tapping an unlikely resource: the cell phone. Hispanics and African Americans are about 2.5 times as likely as whites to put off prenatal care until the third trimester or to get no prenatal care at all. But they are likely to be avid texters. That's why a new public-private partnership, paid for by sponsors including Johnson & Johnson and Pfizer, is signing up expectant mothers and sending them three texts a week, each with a tip timed to their baby's development. With cell-phone companies comping the text charges, text4baby is the first free, large-scale foray into mobile health education in the U.S. Forty states are creating text4baby coalitions and encouraging nurses to talk up the program. Word is also going out through local health departments and TV channels like Telemundo and MTV. The U.S. Department of Health and Human Services plans to evaluate whether text4baby subscribers have better outcomes than nonsubscribers. 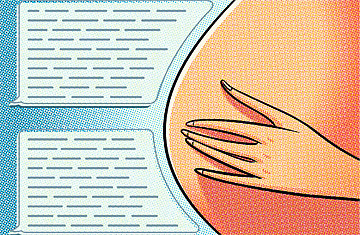 Will texts prompt women to go to more prenatal appointments? Will more women ditch their smokes? And most important, will the incidence of low birth weight and prematurity decline? The idea for text4baby comes from Paul Meyer, chairman of Voxiva, a tech firm based in Washington that started distributing wellness tips by cell phone in developing countries where mobile phones are plentiful but access to health care is not. The U.S. program targets low-income moms but contains tidbits all women might find useful. Meyer's wife beta tested text4baby while she was pregnant with twins. Toward the end of her second trimester, she got in her car and wondered how to position her seat belt. That day, she received a text: "A seat belt protects you & your baby. Shoulder belt goes between your breasts & lap strap goes under your belly (not on or above). Wear it every time." She did. See pictures of pregnant-belly art. See TIME's special report "How to Live 100 Years."